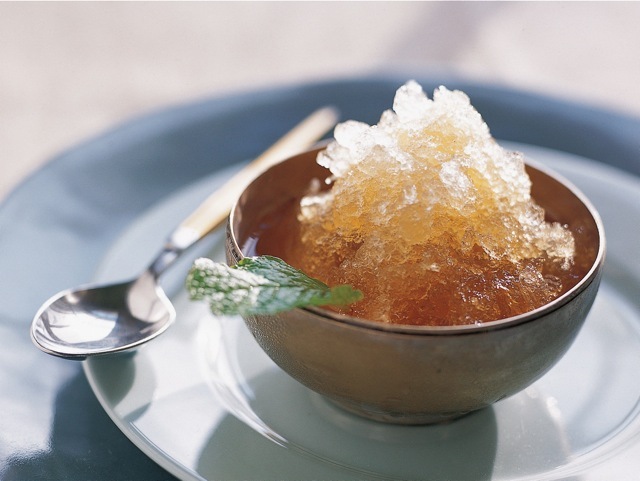 Reminiscent of the traditional sweet tea served after a North African meal, this bracing granita is made with green tea and mint. Wonderful when the weather is hot, it’s a refreshing afternoon delight and a surprising palate cleanser, as well as a delicious dessert. In a saucepan, bring the water to a boil. Add the tea and mint leaves. Cover and let steep for 5 minutes. Strain into another container, and blend in the sugar to taste. The flavor should be quite sweet. Let cool to room temperature. Pour the tea mixture into a 9-by-5-inch loaf pan and place it in the freezer. After 30 minutes, remove the pan from the freezer and stir to break up the ice crystals. Return to the freezer and repeat every 30 minutes over a period of 1½ to 2 hours, until the ice acquires a firm, smooth consistency. To serve, scoop into glasses or demitasse cups and garnish with mint leaves. For the best flavor, serve the granita the same day you make it.